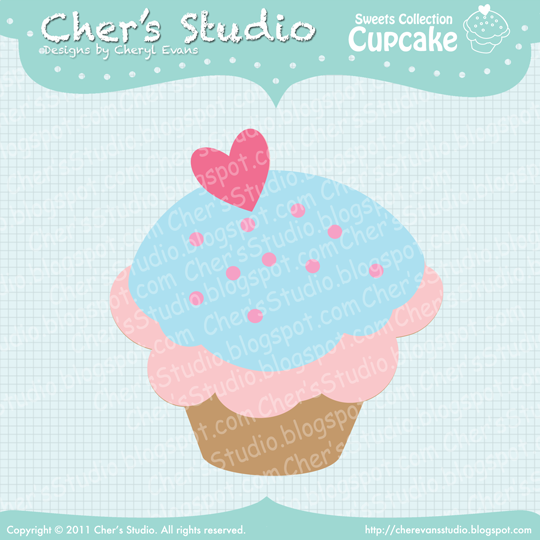 Cher's Studio: Another Friday Freebie! Grab this yummy cupcake while it last. This file will be up for one week only! So tell your friends to come on over and chomp on this delicious SVG. This is so cute! Thanks Cher! Thank you cher!! You are an awesome designer, can't wait to see more! I am a new follower and found you through the comment section over at Getting Cricky with K Andrew!!! I would love if you visit me as well... I will also be a guest designer for Kristal!!!! In Love With a Bug, thank you. I'm happy you like my freebies. If you decide to use in any of your projects, make sure you give a shout to my blog! Thank you for the sweet comments and thanks for following! I will definitely stop by your blog. Kristal is such a sweet lady, I just love watching her videos and reading her blog comments. I will be guest designer in the next week or two, so stay tuned! Love this cupcake! Soo adorable! Your designs are awesome!